Had some coconut left over from making kueh dadar so I made some pandan steamed cake to use up the coconut fillings. Boil both sugar, water, corn flour and pandan leaves in a small pot until sugar has dissolved. Add in grated coconut and cook until dry. Discard the pandan leaves and leave it to cool down. Roll them into small balls to be used later. Put all ingredients into a mixing bowl and beat at high speed until thick and creamy. Pour into mould lined with muffin cups till half full. Add in coconut filling and top it up till full. Steam at high heat for 8-10 minutes. Sharing with you some of the bread I made last week. 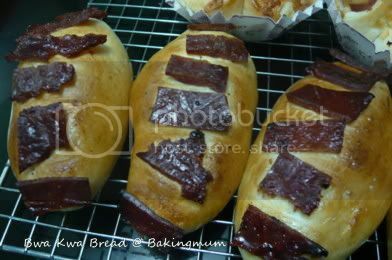 I still have some bwa kwa leftover from Chinese New Year so I used some to make bwa kwa bread. The bread is so soft inside. That is such a pretty color! I don't know what Pandan Cake is But I like the looks of it! Hi KC, the recipe for the coconut filling is under Kueh Dadar. Hi sugamama's cafe, pandan is a kind of plant that give a very fragrant smell. In Asia, we use lots of pandan in our cooking and baking. 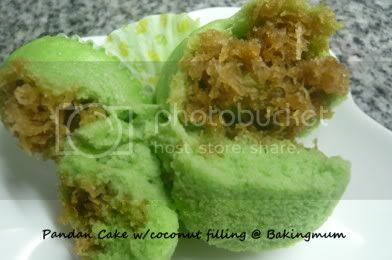 Wondering if you could share the pandan cake recipe. your buns all look really soft and moist!! 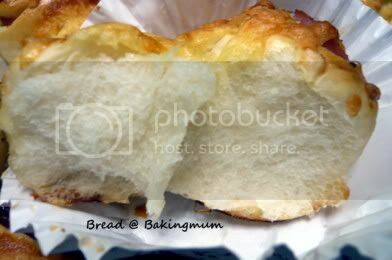 Hi Baking Mum...oops miss out any qn ^-^ may i know how long can the coconut filling be kept? 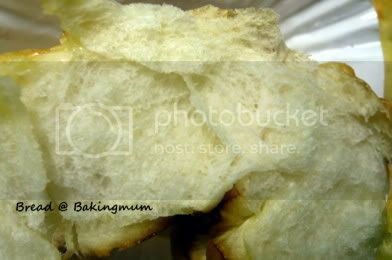 TIA..
Is the steam sponge cake under your recipe if not will you share the recipe with us. Thanks. Steam Pandan muffin looks VERY GOOD! Ur bread looks soft and yum yum too. your buns look absolutely fantastic! can you please post the recipe so i can try it out? thanks so much (:"
Ok, I will share the recipe in a few days' time. The coconut filling can be kept in the fridge for at least 4 to 5 days. Awesome pictures, I hope every one enjoy it. steam this pandan cupcake 2day. easy to make & quite tasty. 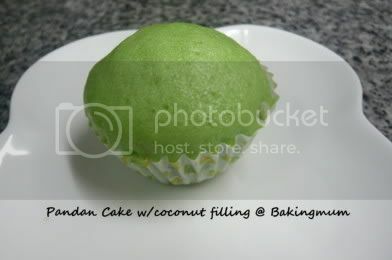 instead of coconut fillings, i used pandan kaya. Tks ! I made this today and it was delicious! Thanks for the recipe. One question though; The muffin pan I have wont fit in my wok; it's mroe for the oven; what do you use to make sure the muffins keep in shape? Or, can I bake this int he oven? Thanks! Hi Ms KT, I use my metal chwee kueh mould with a paper muffin cup inside. If you have egg tart moulds you can use that too. I have not tried baking this so not too sure if it works with baking. That is a great idea! I have them sitting int he cupboard. I am a Singaporean living in Canada and this was a huge hit among my Singaporean friends here! Thanks for your recipe! Will sure be using it again! May I ask.. What is Pandan paste?? What type of flour did u use for the cake?